A wild ride on Exmoor: A Guardian Country Diary piece on gathering the Tippbarlake Herd of Exmoor ponies. You can read the piece here on the Guardian’s website. Fudge and me out on Exmoor for the gathering. Fudge lives at Brendon Manor Stables. Photo by Dawn Westcott. When the first of the herd appeared on the horizon over Withycombe Ridge, the horse I was riding began to tremble. Excitement pulsed up the reins and I could feel his heartbeat thumping through the saddle. He stared transfixed, head high, pink nostrils flared, as the feral ponies flickered into view, their dark brown coats almost plum coloured next to the dun moorland. They came closer, flowing down the hillside and splashing through the tiny ford at Lank Combe. We could see the light, mealy-coloured patches marking out their eyes and muzzles. This colouring is a distinct feature of the Exmoor pony, Britain’s oldest native pony breed. 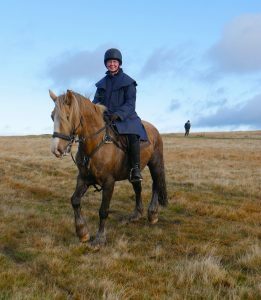 The ponies have been part of Exmoor’s bleak uplands for hundreds, probably thousands, of years. They live as separate herds, free-grazing but ‘leared’ to particular areas. At the traditional autumn gatherings, they are brought down to farms to be checked and the foals sold.